This form should be submitted annually by May 1. Chapters interested in qualifying for chapter awards must submit the annual report before the due date. Each year, the sorority awards chapters the traditional palm, star, crown recognition levels and one chapter will win the Crown of Excellence award. 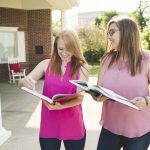 Additionally, Alpha Sigma Alpha will award chapters outstanding performance in a particular area which includes: Membership Growth, Service and Giving, Collegiate Chapter Support, Alumnae Panhellenic Engagement and Outstanding Programming. Please review the resource “Alumnae Chapter Award Guidelines” for more information. In order to achieve any of the specialized awards, the chapter must obtain at least crown level recognition.